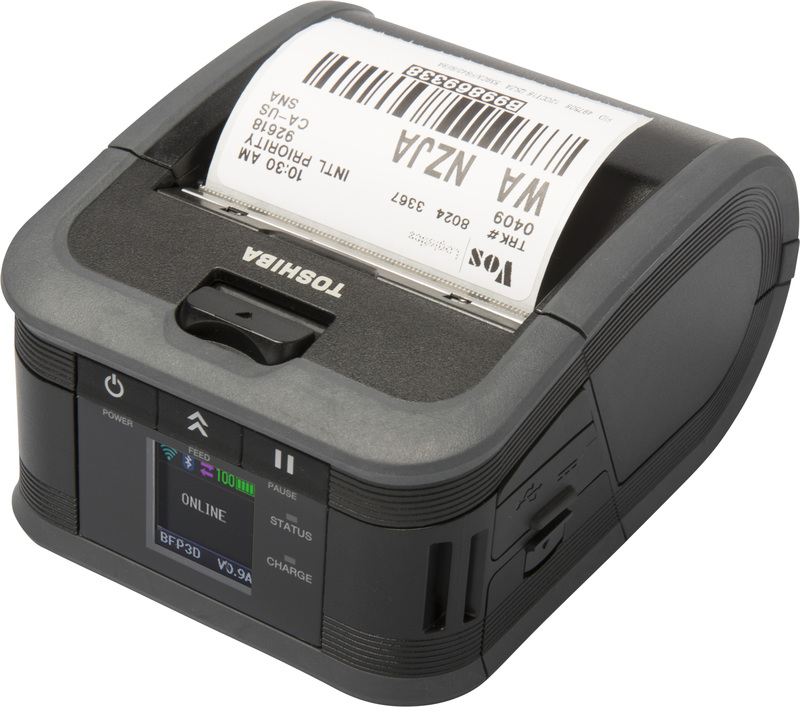 Toshiba America Business Solutions today expands its portable thermal barcode printer line with the introduction of its B-FP3 series featuring high-speed (6 IPS) three-inch receipt and receipt/label models. The light, compact and rugged printers deliver best-in-class performance for mobile printing. The robust printers operate in extreme temperatures, have IP54 dust protection and splash-proof ratings with proven drop-resistant durability for use in virtually any environment. High-capacity media for up to 560 labels or 183 feet of receipts reduces the need for frequent media changes while an adjustable media guide provides users with the flexibility to print receipts and labels ranging from .94- to 3.125-inches in width. The intuitively-engineered B-FP3 series was designed for demanding and high-production environments in transportation and logistics, retail, manufacturing and field service operations. Color LCD displays enable clear visibility of battery levels, printer and connection status. Toshiba's printers implement built-in WiFi and USB or Bluetooth and USB connectivity and are capable of pairing with NFC embedded devices such as smartphones, handhelds and mobile computers. The B-FP3 series is compatible with ESC/POS, Zebra ZPL®, CPCL® and Toshiba TPCL languages to seamlessly integrate into retail and warehouse systems. The printers also support iOS, Android™ and Windows® CE devices via the software development kit. "We have incorporated an extensive feature set into a small ruggedized footprint that will enable organizations to operate more efficiently and effectively," said Bill Melo, Toshiba America Business Solutions chief marketing executive. "The B-FP3 series meets the wide range of labeling, ticket and receipt needs of our diverse customer base, rounding out our barcode printer line." The B-FP3 series is now available for purchase through authorized Toshiba dealers. To learn more about Toshiba barcode printers or to locate an authorized Toshiba dealer in your area, visit www.business.toshiba.com. Toshiba’s B-FP3 series features a one-year standard return to depot warranty.